indian love call | THAT'S ENTERTAINMENT! Welcome to another Musical Theatre Monday and the continuation of our extended series on the best musicals from the 1920s! This infamous decade was a booming time for musical theatre as the emergence of new talent — both onstage and off — led to a culture that more than ever celebrated outstanding individuals and their creative accomplishments. Broadway was the brightest place on Earth. Though the incredibly important Show Boat (1927) appeared three-quarters through the decade, its narrative strength wouldn’t begin appropriation to other musicals until midway through the next decade. This landmark musical aside, the musicals of the 1920s are largely frivolous affairs — trivial books (if there IS a book) with sizzling scores, memorable dances, lavish production values, and the most exciting musical theatre stars of the century. Over these next few months, we’re going to be looking at some of these notable musicals. We’ll be going chronologically, but we won’t be doing one per year like we have in the past; some years will be skipped, others will house multiple shows. In these regards, I really am presenting to you what I think is the best of the best. We’ve covered Sally (1920) and Shuffle Along (1921). Even though I alerted you that we wouldn’t be covering musicals from every year of the 1920s decade, I do want to preface today’s musical by giving you a brief generalization about what appeared in 1922 and 1923. Essentially, there were a couple of Kern shows (though none as good as Sally or Show Boat), the annual Music Box Revues with scores by Irving Berlin (listen to those here), and lots of inconsequential musical comedies that have largely gone unrecorded. 1924, however, marks an incredible shift in musical theatre history with the real establishment of the 1920’s sound. But that’s for next Monday. Last week, I teased that we’d be detouring into the realm of operetta, so here we are in 1924 with one of the best remembered…. If you think opera is a maligned art form, I can assure you that operetta has almost been a dirty word from the moment it went out of favor in the ’30s and gave way to the more traditional style of musical comedy with which we are accustomed. But you may be surprised to learn that in the 1920s — the roaringest of decades that produced the hottest American tunes — half of the ten longest running shows of the decade were operettas! The three men that you should know about with regards to American operetta are Victor Herbert, Sigmund Romberg, and Rudolf Friml. Those latter two are particularly important in the 1920s, and I’ll be covering one show by each before this series is done. 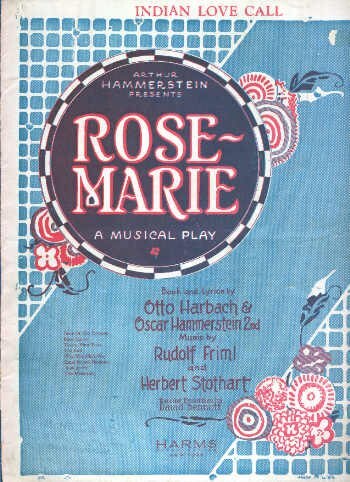 Today’s is Rose-Marie, which features music by Friml and Herbert Stothart, and book and lyrics by Otto Harbach and Oscar Hammerstein II. The show may be most memorable to today’s audiences for its three film adaptations — a silent one in 1928 with Joan Crawford (thank goodness it was silent, right? 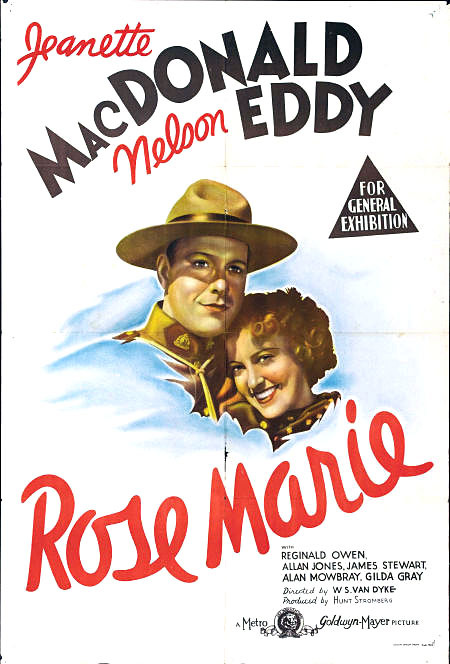 ), an iconic 1936 adaptation with Jeanette MacDonald and Nelson Eddy, and a 1954 color adaptation with Ann Blyth and Howard Keel. The show opens at Lady Jane’s (Dorothy MacKaye) inn in Saskatchewan, Canada. 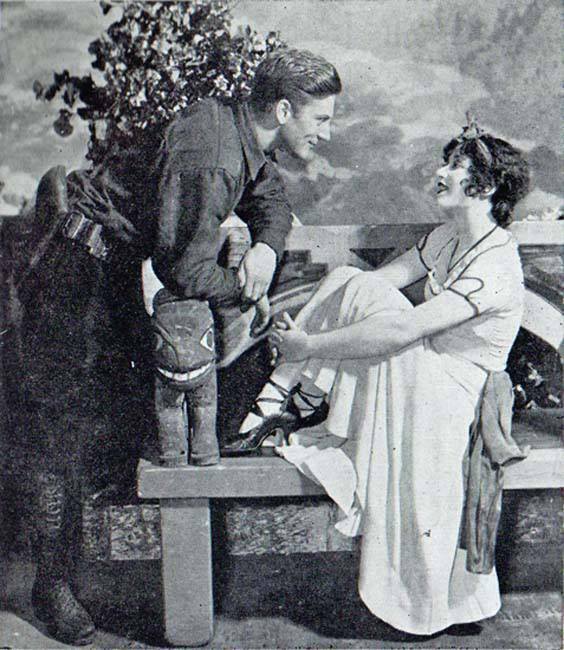 “Wild Jim” Kenyon (Dennis King) has been romancing a young French Canadian girl named Rose-Marie (Mary Ellis), much to the chagrin of her brother Emile (Edward Cianello), who believes his sister should marry wealthy Edward Hawley (Frank Grenne). But Hawley has been secretly carrying on with Wanda (Pear Regay), the wife of Native American Black Eagle (Arthur Ludwig), with whom Jim and his friend “Hard-Boiled Herman” (William Kent) (who has a side romance with Lady Jane) are involved in a mining claim dispute. Emile tries to get Rose-Marie to leave with him and Hawley, but Hawley must first end things with Wanda. He goes to her cabin and is caught by Black Eagle. A fight erupts and Wanda stabs Black Eagle to protect Hawley. Hawley later proposes to Rose-Marie, but she turns him down, opting instead to go with Jim to Brazil. They make plans to meet at a sacred castle, but news comes that Jim is wanted by the Royal Candaian Mounted Police, led by Sergeant Malone (Arthur Deagon), for the murder of Black Eagle, since the claims map was found near his body. Emile, aware of Jim’s whereabouts, promises not to reveal his location if Rose-Marie will agree to marry Hawley. She reluctantly agrees and alerts her lover to go on without her. Act Two picks up months later as Rose-Marie and Hawley are about to wed. Meanwhile, Herman and Lady Jane have married in the interim, and he catches her giving a kiss to Sergeant Malone. Jim returns with Wanda, who intends to clear his name. But Rose-Marie jumps to the wrong conclusion and assumes that Jim killed Black Eagle because he was carrying on with Wanda. Wedding plans resume and Jim goes back into hiding. Herman figures out Wanda’s culpability and tricks her into confessing by leading her to believe that Hawley has accused her of the murder. Lady Jane sees the two together and assumes that Herman is getting back at her for the kiss with Malone. At the wedding, Rose-Marie heads down the aisle and is interrupted by Wanda, who publicly confesses the truth. Rose-Marie runs to reunite with Jim. The original Broadway production ran for an impressive 557 performances, and journeyed across the pond in 1925 where it played for 581 performances. It also played Paris, and toured Australia, Canada, and the United States throughout the 1920s. A few smaller revivals came in the ensuing decades, and many regional productions followed until the ’60s, when Rose-Marie gradually stopped becoming an operetta staple. (It was also the main target of the satirical Little Mary Sunshine, a 1959 Off-Broadway musical that sent-up operettas.) A 1981 Smithsonian concert produced an unreleased audio recording that featured as near a complete score as possible. In addition to recordings by the Original London cast, there have been several studio cast recordings that account for a good majority of the score. My two favorites are a 1958 studio cast recording with Julie Andrews and Giorgio Tozzi, and a 1961 studio recording with Barbara Leigh and David Hughes. I chose to highlight this show because I think the score is perhaps Friml’s most accessible to non-operetta lovers. In addition to the romantic waltzes and overblown marches associated with the genre, there are examples of more contemporary dance and music styles — most notably the fox trot. It actually makes for very rich and surprising listening, and I want to share a few numbers with you. Most notably, Rose-Marie contains one particular all time classic: “Indian Love Call,” which is reprised by the lovers several times throughout the show. Above are Andrews and Tozzi. Perhaps the only other numbers that regular audiences may recall are the two that were retained in both talking film adaptations. Above is the rousing “The Mounties,” led by Sergeant Malone and ensemble. That comes from the 1981 Smithsonian recording. Below is the title number, which is repeated several times throughout the show, but initiated by Jim and Malone. Here is Nelson Eddy’s rendition. Rose-Marie herself leads the ensemble with the jovial “Pretty Things.” This is the wonderful Julie Andrews. The side (and comic) romance of Lady Jane and “Hard-Boiled Herman” gives several ditties, but my favorite is “Why Shouldn’t We?” This comes from the 1961 studio cast recording. The last number I want to share is one of my favorites — the most exciting undiscovered gem from the score, as far as I’m concerned — “Totem Tom-Tom,” a mad dance led by Wanda and the Native Americans. (Called Indians here, of course.) This is the hottest number in the score. For those who are still uninterested in operetta (and there’ll be another chance with Romberg in a few weeks), don’t worry — we’ll be back to more traditional musical comedies next Monday. In fact, we’ll be covering a sizzling template-setter with one of the best scores of the decade. Excited? I am. So come back next Monday for another 1924 musical. And tune in tomorrow for the best episodes from Season One of Green Acres!